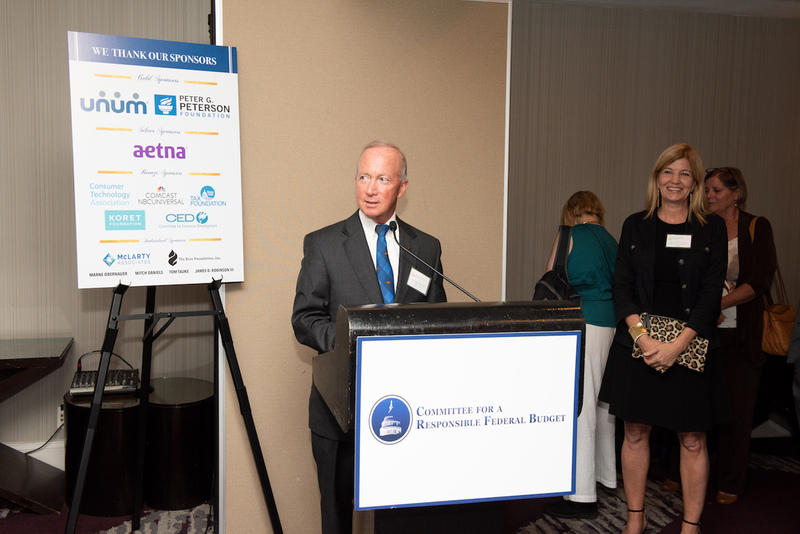 On Thursday, September 13, the Committee for a Responsible Federal Budget hosted its 2018 Annual Dinner at the Liaison Hotel on Capitol Hill. We had a record turnout and an opportunity to pause, relax, and celebrate everyone in the budget community who has fought the good fiscal fight during the past year. 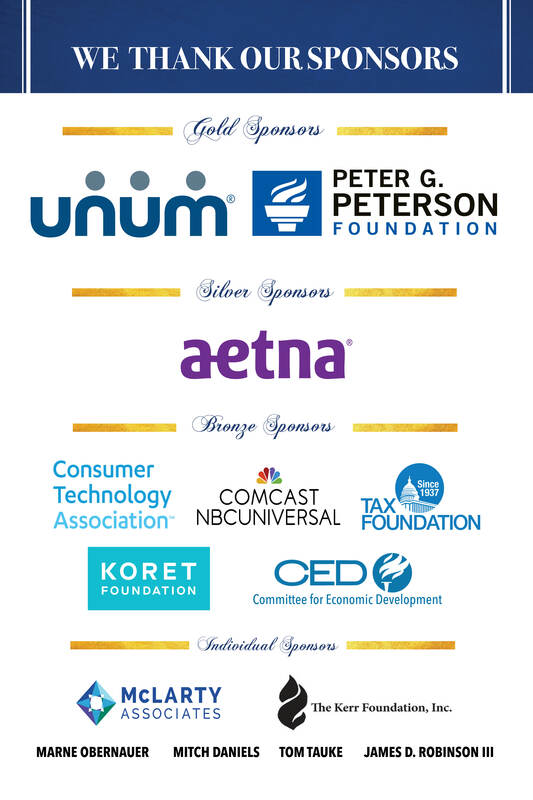 Guests included Members of Congress, high ranking Hill staff, corporate leaders, and top thinkers in the budget community. The evening began with a reception where Governor Mitch Daniels discussed the importance of working together on the debt issue. We then moved into dinner and had the opportunity to hear from CRFB Co-Chair Tim Penny who presented a lifetime achievement award for fiscal responsibility to Carol Cox Wait, followed by a moving talk about leadership by Secretary Leon Panetta. 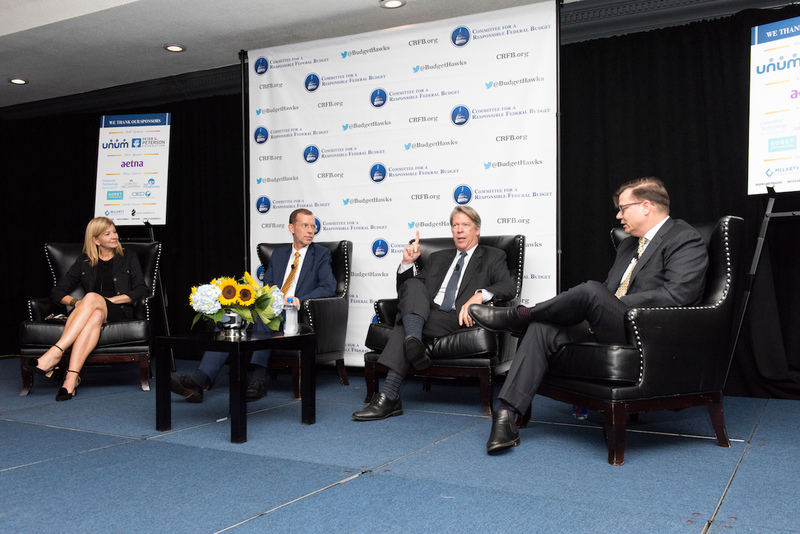 The evening was capped off with a lively discussion looking into our fiscal future, led by CRFB president Maya MacGuineas with Dean of the Harvard Kennedy School Doug Elmendorf, Chief White House Correspondent for CBS News Major Garrett, and Ipsos President Cliff Young. As deficits steam toward a grim 13-digit milestone, there are a trillion reasons to stay involved during the coming year. We hope to see you at one of our future events. CRFB co-chair Mitch Daniels emphasizes perseverance in the face of an impending debt crisis. 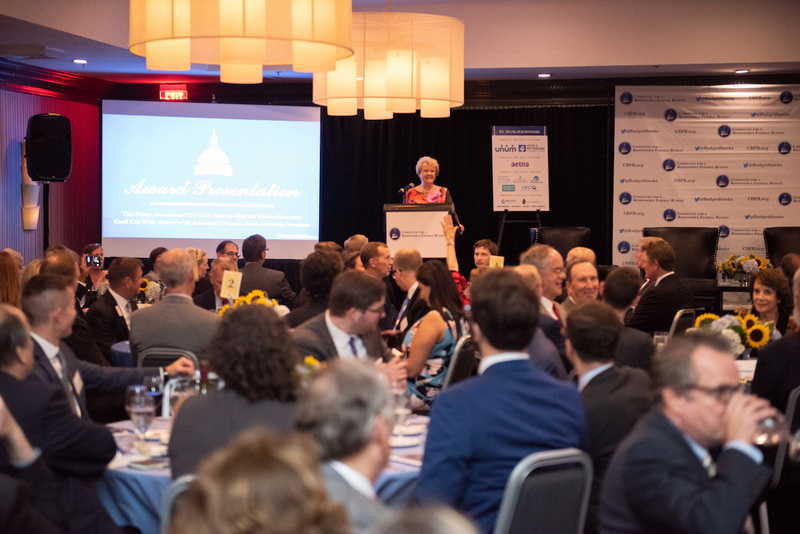 Carol Cox Wait speaks at the Committee for a Responsible Federal Budget’s Annual Dinner after receiving the 2018 Lifetime Achievement Award for Fiscal Responsibility. 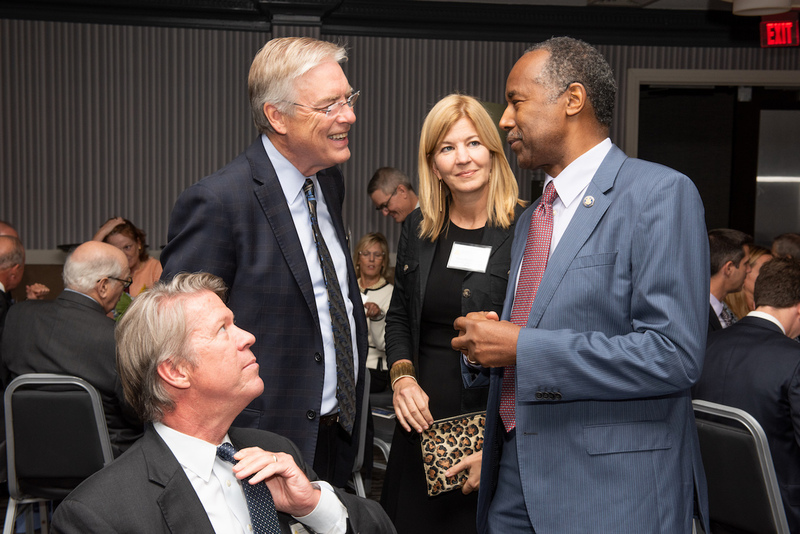 CRFB president Maya MacGuineas chats with HUD Secretary Ben Carson, Major Garrett of CBS News, and CRFB Co-Chair Tim Penny at the CRFB 2018 Annual Dinner. 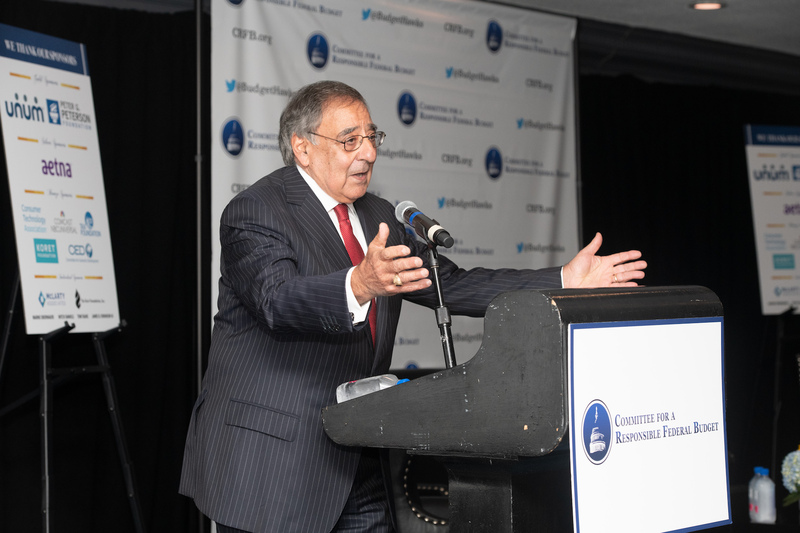 CRFB Co-Chair Leon Panetta shares lessons in leadership and urges the rejection of governing by crisis in remarks at the Committee’s 2018 Annual Dinner. Maya MacGuineas leads a discussion about our economic future with (L-R) Dean of the Harvard Kennedy School Doug Elmendorf, Chief White House Correspondent for CBS News Major Garrett, and Ipsos President Cliff Young at the Committee for a Responsible Federal Budget’s 2018 Annual Dinner.